Justine's Cardmaking: 12 Days of Christmas *Day 5* Non Traditional Colours + Giveaway! 12 Days of Christmas *Day 5* Non Traditional Colours + Giveaway! Thanks for joining me for the 12 Days of Christmas, Day 5! I'm going to be working with non-traditional colours today for Christmas Cards creating with My Favorite Things products! Their latest release is so much fun, with lots of big, bold, sentiments and dies for gift ideas. As a bonus to the video, I also demonstrated how to use the lip balm die! A big thank you to MFT for sponsoring today's giveaway! 2x $50 gift certificates for TWO lucky winners! Sometimes it's fun to take dies that have a lot of pieces and simply die cut them in a variety of colours to put together. You can create amazing scenes that sometimes you just can't plan. The houses in bubblegum pink and lemon chiffon yellow remind me of the colourful houses in Denmark. To compare, I also created a card with traditional colours to show off the difference. I love all the pastel colours - who would have thought to use them for Christmas cards? I love having a frame for my scenes and stitched dies have been a favourite of mine for a long time. I think if just completely frames everything nicely and makes the card look clean. These lip balm dies are so innovative! I love the fact that you can add little gifts into someone's stocking or secret Santa gift that are homemade. You can also fill the tube with candy or like I did, with sequins for a crafty friend to use! Thank you to MFT for sponsoring today's giveaway! Great cards and ideas. I have to say I’m more of a traditionalist. I tend to use Christmas colors . Thank you for sharing these ideas. And would do turquoise and white and silver instead of red and green for a different look. Really enjoying your 12 days of Christmas. Love the non traditional colours and these gift tags are super cute. I tend to stick to traditional colors but would like to try the turquoise color. I was just able to order the lip balm pouches!! Another wonderful video, Justine! Thanks so much for sharing your great ideas with us...I love using the lip balm pouch for sequins...so clever! I love these tags and snow globe cards! I never know what to do with these die cut sets, and now I have some ideas. Thank you! These are so adorable!!! Love the nontraditional colors and the cute little scenes. I have many of the items you used in this tutorial. I'm waiting for the lip balm window and frame to arrive in the mail! Thanks for the super creative ideas! I love the yellow and pink houses! The colors made the card pop! So Pretty! Love the cards! Thanks for sharing Justine! My fav non traditional colors would be yellow and blue! These are so flipping cool! I really love the pastels too! TFS! Love these die sets. I tend to stick to traditional colors but have been doing a lot of pink, mint green and like a soft blue lately. I do like purple, silver and white too. Love these products from MFT! Your projects are adorable. Love the traditional Christmas colors. Would use Mint green & pink for non traditional. Cute cards! Love the use of non traditional colors. I'm definitely roll with that punch :), unless its sparkles :) Lovely ideas. Love this 12 days of creating! And, each day its always more than one card! So, we can really get our stash going.. right? Such a fun scene on your cards! I am using non traditional colors this year--pink and gray! Sometimes it's fun to mix it up! Cute projects! I love that lip balm die! Justine, I just really love all your cards. I tend to be more the red and green colors for xmas cards but will try the non traditional colors this year. Love the pastel colors for Christmas. Those Lip Balm holders are fabulous! Super cute cards and the lip balm dies are in my wish list since they sold out immediately on their release. Love those cute houses! Really sweet projects with these fun stamps and dies from MFT! LOVE the Lip Balm Tag, I can think of so many other small items to build this around, especially as Teacher or Co-Worker gifts! Well done! Thanks for sharing your work. The cards turned out super cute. Wow! Beautiful cards and your lip balm pouches are a fantastic idea for handmade Xmas gifts! I tend to use Christmas colors like red. green and golden. I've never used unconventional colors but I would love to try turquoise and pink on my cards! I love to use bright pink, purple and teal colors for my Christmas cards. I really like the pastel colours, it's a refreshing change from the traditional hues. I haven't made any non-traditional coloured Christmas cards, but I'm inspired to give it a go. I also love the lip balm window. Thanks for sharing. Lovely cards and gift pouches. i'm currently in a green and purple phase so I'll be using those colours a lot this year. Beautiful cards, Justine! These lip balm pouches are super fun. Cute cards! I like to less traditional colors sometimes! I love the non-traditional colors you have used. Thank you for inspiring us to just go for it & try something new. Love the cute snow globe cards! The lip balm holders are adorable. I need to make about 10 of those! I use mostly traditional colors on my cards but do slip some pink & purple in now & then. I'm pretty much a traditionalist when it comes to my Christmas cards. I always use various shades of red and green. I did like your pastel versions though. Love the MFT dies. I am loving those pastel houses so much! I did pastels for my Christmas cards last year and was going to go with more traditional colors this year. After seeing this, I might just have to do pastels again. Super cute projects, love the tags/bookmarks ideas, love the non traditional holiday colors. I like using blues and white this year. Your cards and gift ideas are fantastic Justine. I tend to make traditional coloured cards but I have been known to make some non traditional ones, the latest ones are pink/purple/silver and I have to say, I like them and so do those who have seen them...SCORE! I totally love MFT's innovative dies, they really put a lot of thought & effort into coming up with some amazing new dies. Gorgeous cards! i love the idea of using the little pouch for other little gifts. 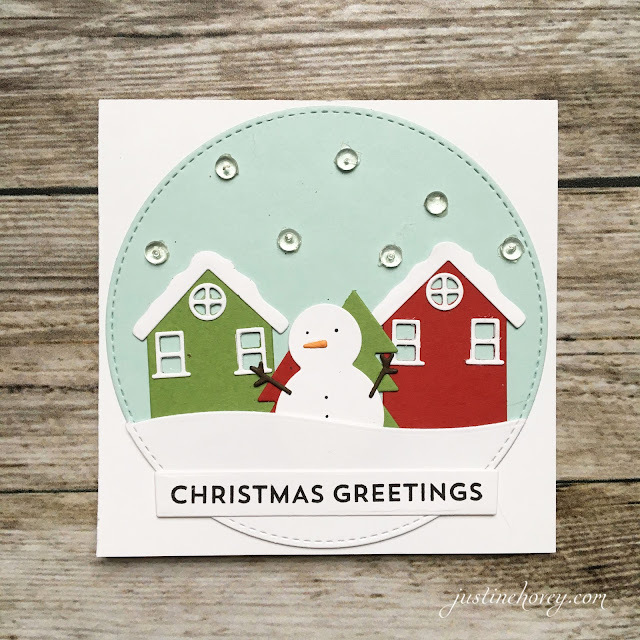 MFT always designs cute dies and stamps, Christmas is no different. Thanks for the inspiration! Great idea for a nice gift. I guess I gravitate to traditional Christmas colors, but I have tried out other color combos and loved them! I love your color choices and am now encouraged to try others again. Oh, my! I love the non-truadional colors - they are so peaceful. Your work is beautiful and those lip balm holder are over the moon. You have such great talent - love you blog (I'm a follower). Thanks for this sweet inspiration.......you rock! I really love the unique lip balm holders! Didn't even know they existed! so cool! Love the pastel colors. Going to have to get the lip balm die. I get my kids and sisters lip balm every year. Thanks for sharing your talents with us. The closest I get to using non traditional colors is black and white or white and kraft. Purple is a colour that I use. Love the lip balm tags! Very cute cards! I typically use traditional colors on my cards but you’ve inspired me to try some non traditional colors this year. Your cards are very sweet, I really like the gift tag ideas. I kinda like the non traditional colors for a change. But enjoy both! thanks for sharing the video! Fabulous projects using the MFT products...love those tag gifts. This year's card will be a soft blue with silver, white, and black accents. I love your non traditional snow globe card -- reminds me of sugar sweets! Love the gift tags with lip balm holder. Loved the colours on these Christmas cards too! Cute projects. I like the colors but I prefer traditional colors. It all depends on the card and who it's going to. Sometimes it's traditional colors, other times it's not. I also like icey blues, purple and silver. Raspberry, teal and gold...lots of possibilities..That's the great thing about paper and ink, if you can dream it up you can create it! I really like these dies for the lip balms. What a great idea to put sequins in them for craft friends. I like blues and turquoise colors for non-traditional cards. Such great gift ideas! So many little crafty things you could put in the holders. I love both color combos you used on the cards. Wonderful projects and lovely color combinations. This year I have used both traditional and non-traditional colors on the cards I have made so far. I really like the houses and snowman card. The non-traditional colors are cute and happy! I love your cards and your shaker/lip balm goodies gifts! I love to add purple to my cards as it is my favorite color! Non traditional colors are fun! The lip balm holders are cool, I don't have any of them but I had some glue stick packaging that I saved (I keep everything....the crafting hoarder) and lip balms fit perfectly in the glue packaging. Also, I really like the darker traditional colors you used. My favorite colors are very dark burgundy or ox blood and dark pine green. Wow, MFT comes up with the most creative dies! Thanks for the ideas on how to use them. The lip balm die looks like it would be perfect for creating prizes for the games we play during our family Christmas celebration. I bet a couple bills could be rolled up like lip balm. My favorite colors for t h ealing holiday are burgundy, deep green and gold. Love these cards. The non traditional colors are great! I love the pastels. Who says those colors are only for spring. Thank you for all your videos and can’t wait for Monday. I really love the colors you chose. I also like the tags and all the coordinating dies. I can think of so many possibilities. I love your cards, clean & simple. The videos are great, I really look forward to them. Love the colors you used!! Thank you for sharing! So cute and festive even if it's not the traditional colors!! Cute cards and tags, I tend to focus on the stamps or sentiments I want to use for the Christmas cards the colors do not really matter to me. I never would have thought to put Chapstick in different packaging. I could also put some that I make in it. So cool! Love how you used the lip balm pouch on a tag, it turned out so cute! I have only ever used traditional colors an my holiday cards. The non-traditional colors are lovely and I love the idea of using the lip balm pouches for sequins or even little candies. Thanks so much for this post!!! I got this MFT snow globe die & extras for my Tags this year and you gave me extra, awesome ideas for them😊💖!! Lovely cards Justine, so easy to mass produce these cards! These are so cute! I love MFT products, and you used them perfectly! Cute cards! I love non-traditional colors. I have used pink, turquoise, purple, etc on cards I have made. I love to mix it up! Love love love these cards and tags!!! Great colors too!! I love using non traditional Christmas colors! Created a card the other day with red, bright green,yellow and blue snowflakes!!! Turned out beautifully!! Love the colors, love the tags!! That was cute and different!!! I absolutely love that die for the chapstick or sequin gift!! Love this the card and gift and stepping out of comfort zone using non~traditional colors it really turned out great. Super cute cards and tags. I wasn't sure if I was going to like the non-traditional colors...but...I really loved them! I used a mint and cream color combo last year for some holiday thank you cards. Thank you again for your inspiration! Adorable cards. 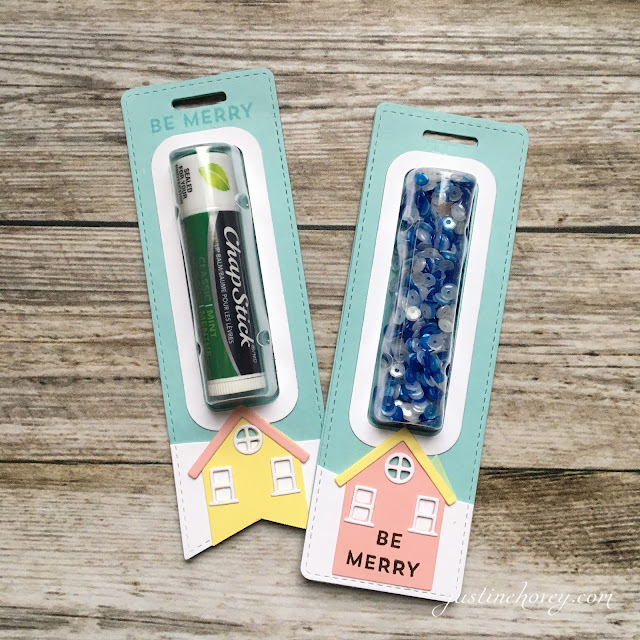 Love the idea of the chapstick tube holder which makes for a cute little gift! I love the colors on the cards. I love non-traditional colors for Christmas! How clever to put sequins for crafty friends! I like to make pink snowflake Christmas tree cards. Pink is my favorite color! Non traditional is awesome. I love stepping outside the box. How fun! Great colors too! The little houses are adorable! I love the fun little tags they are so cute. The village scenes are cute too. Thank you for sharing. I love snow globes and these are so cool. Your talent amazes me! I love what you have done here, and I think that I like the non-traditional colored one the best! These are super cute. And I think the pastels are an awesome idea for Christmas. I love MFT!! The colours you used are do pretty and the lip balm holders are amazing. So fun. I love using non-traditional colours for Christmas. This month, I created a bunch of pink Christmas cards, and a while back, i created a card using Catherine Pooler's Spring Fling inks. Your card reminds me of those colours. what cute hat cute Little Houses! I tend to use a little patterned paper with my Christmas cards, but that just makes it easy for me to experiment with colors since so many great paper lines put out amazing paper in both traditional and non-traditional combos. I get bored if I stick to the normal red & green! Great projects today!!! I love non-traditional colors for all of the holidays. It helps the designer to not get stuck in a rut. Thank you! I would love to get a card kit for myself with this gift certificate. This is so cute! Love the lip balm cases! Justine - - I've been following some other blogs where non-traditional Christmas colors are the rage - - like pink snowflakes. I like the pastel houses -- maybe Denmark. Maybe also Charleston, SC - oh yea, they don't have snow. Lovely. Adorable!! Love the colors and I am a sucker for a snowman!! i love the ideas with the chapstick holder. You did an absolutely wonderful job with these cards!! I love placing my images and die cuts in a circle! I think that it makes the image look as if it was in a snowglobe. Super great cards, even with the nontraditional colors! So cute!! Love the chapstick holder! The little houses are just adorable. I would love to make that card! Great cards and I like the die cutting with no coloring for something fun and different! I don't tend to use many non-traditional colors. I really love the red and green of the season with pops of silver or gold. Thanks for this fun series and your awesome videos!! Love the lip balm holders! Beautiful cards! I use navy and plum in my Christmas cards alot. I think I must be a traditional girl at heart, as I preferred the traditional colours. How fun is this?! And who doesn't love a new tube of lip balm?! Especially in winter! Love the lip balm die. Perfect for holiday time and really any special occasion. A great idea for little gift! Love! love, love MFT stamps and dies! I really like the lip balm die and love the way you varied the use of it! Your videos are such a learning experience! Thanks! I am crazy in love with the bookmark shaker dies! 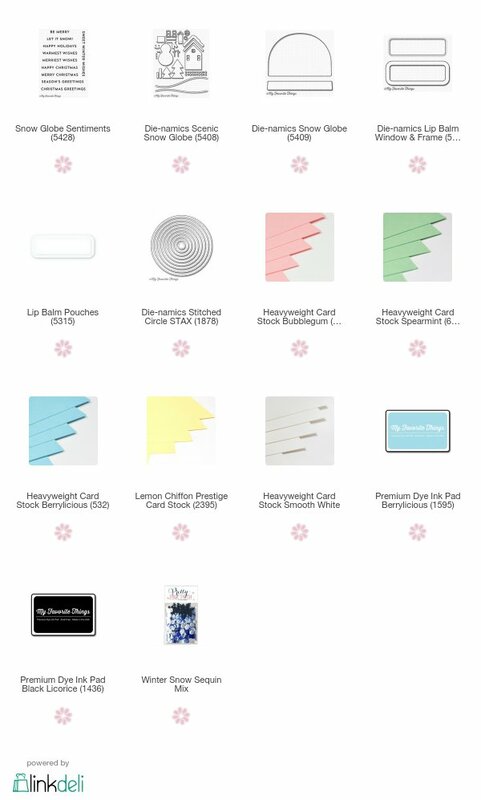 I need to start ordering supplies online but I know once I start ...LOL I'm sure you all know the rest! I love using pink and teal as non traditional colours! These are really fun cards love them but the lipbalm is fantastic! Very pretty colors and love the gift tags you created. I am pretty traditional with my colors. Besides red and green I sometimes use navy and silver. I like to use non-traditional colours. I really love MFT products and that lip balm die is on my list of things I need! Great ideas again! I really like the lip balm holders, as I make lip balm for gifts all the time. These cards are so sweet. I love the color combos - so fresh and pretty. The lip balm holders are cute. What good ideas for memento gifts. Thanks for sharing. The lip balm die is really awesome. And I actually love your Christmas cards in any of these traditional or non-traditional colors. These are so cute and I love the colors! Great job. What a cool idea, and I love the soft colors! I like both the traditional and the pastel colors. I wonder if a small roll of candy--maybe lifesavers?--would fit in the chapstick pouches. I don't know that I would give away chapstick, so I would have to come up with something else to put in the pouch. These snow globes are so sweet, I really like the soft colors! Depends on the design if I go with traditional or non traditional colors. I have used purple, blue and pink. Cute idea using lip balm. I love the colors! So cute!! What a great idea for a little gift for my crafty friends!